With the second most powerful and painful sting known to man, the Tarantula Hawk Wasp is a pest you don’t want any part ofâ€¦ And neither does a tarantula! 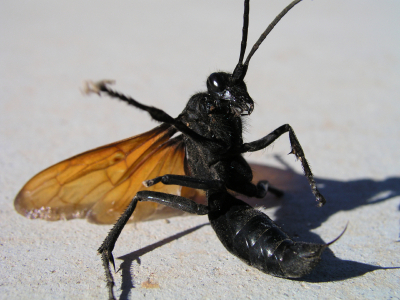 The Tarantula Hawk Wasp gets its name because it hunts tarantulas to host their offspring. When a female Tarantula Hawk Wasp locates an unsuspecting tarantula, it will attack; stinging the tarantula. Almost immediately, the tarantula will become paralyzed from the wasp’s sting as it gets drug back to the wasp’s nest. The Tarantula Hawk Wasp will then deposit her eggs inside the paralyzed tarantula. Once the wasp’s offspring hatch, they will feed on the creamy insides of the still tarantula, essentially eating the poor spider from the inside out. The massive Tarantula Hawk Wasp measures almost two inches long, and has a very dark blue body with rust-colored wings. The wasp has really long legs that are equipped with hooks used to wrestle with tarantulas. What insect has one of the most painful stings? – meet the Tarantula Hawk, pepsis wasp! 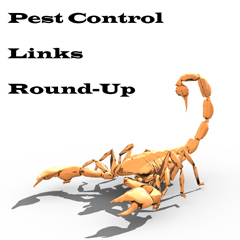 Caulk… your first line of defense against bugs and pests!